A sign welcomes visitors to Orr, Minn.
A disagreement over operation of a translator in northern Minnesota has jeopardized prospects for continued public TV service to the remote area. The translator, licensed to local company Orr Area Minneonto II, rebroadcasts signals of Duluth PBS station WDSE, as well as Duluth ABC and Fox affiliates. 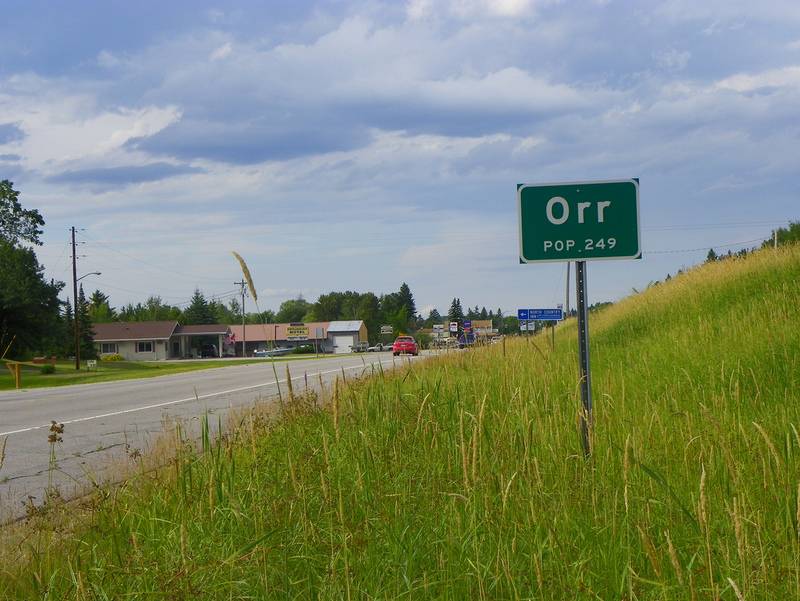 Located north of the small town of Orr, population 267, the translator reaches viewers north of the city, an area near the Canadian border where trees outnumber people. Minneonto was founded by community members who wanted to bring television services to the area. Until 2012, it subsisted on a share of property tax assessments from Orr and Leiding, another town in the translator’s coverage area. But when Leiding ended its contributions, Minneonto decided to stop relying on Orr for sole support, according to Minneonto Secretary and Treasurer Curt Glass. Minneonto now must come up with a way to cover its annual operating costs of $12,000 and pay $7,000 for a paint job to bring the tower back in compliance with Federal Aviation Administration regulations. Running low on reserve funds, it temporarily shut down its translator in April, according to Glass. Meanwhile, Glass said, a company that provides tech support for the translator contacted the rebroadcast stations to ask for financial support for Minneonto. 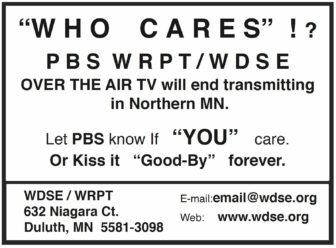 “Within a day, both Fox and ABC agreed to support the tower, but the reaction from WDSE (the PBS station) was pretty surprising,” Glass wrote in an email. WDSE-WRPT declined to contribute. The slide displayed during the WDSE translator’s outage. Regardless, Harmon proposed in a May 26 email to Glass that WDSE-WRPT would give Minneonto $150 per month for up to three months “in order to provide for the temporary continuation of service to our viewers while Minneonto TV II seeks sustainable funding.” Minneonto would be required to describe its progress toward finding sustainable funding on a monthly basis. It would also have to submit an income statement and balance sheet. Harmon said he also wants more of the involved parties to help find solutions. “It’s not going to be just us,” he said. Minneonto has yet to respond to Harmon’s offer, he said, and the nonprofit has not replied to a request for comment from Current. Harmon’s willingness to support Minneonto could affect its ability to raise funds from other donors. The board of Saint Louis County, where Orr is located, has offered to provide Minneonto $1,800 per year, but only if WDSE-WRPT provides matching financial support, according to Saint Louis County commissioner Tom Rukavina. Saint Louis County aims to keep the tower functioning for the rest of the year and is working with Minneonto to find a long-term funding source, potentially through assessments from other nearby towns, Rukavina said.